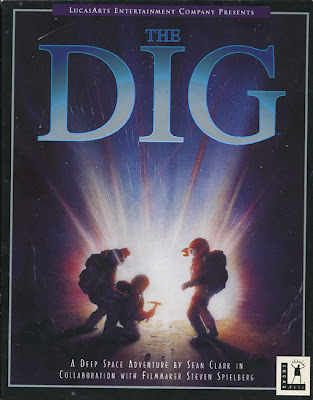 The Dig was based on a concept that Steven Spielberg originally had conceived for his Amazing Stories television show in the 1980s. The episode was too expensive to film, so, since Steven Spielberg was a big fan of video games, he later gave the idea to LucasArts to design a game around it. The Dig began life as a game in the early 1990s, using a custom engine called StoryDroid. It was later moved to the SCUMM engine, which was enhanced to utilize the features from StoryDroid. It had a tumultuous development cycle, going through three project leaders before it was finally released on November 30, 1995. The project was first lead by Noah Falstein (co-leader of Fate of Atlantis), then later Brian Moriarty (project leader of Loom), before it was finished and released by Sean Clark (co-leader of Sam & Max: Hit the Road). So much art was created and then discarded for the Brian Moriarty version of The Dig that a Star Wars adventure game starring Boba Fett was pitched to LucasArts using the unused art. That project never made it off the ground because LucasArts management felt no one would want to play a game as Boba Fett. The Dig is now supported by ScummVM, a program designed to let 2D adventure games run on multiple platforms. With ScummVM, The Dig now runs on modern versions of windows, as well as Linux, Mac OS X, and many consoles such as Dreamcast, Wii, PlayStation 2, and PlayStation Portable. For a complete list of platforms supported by ScummVM, see here. The retail versions are now out of print, but The Dig can still be purchased digitally from GOG.com and Steam.